Bring on the sad, ugly pears! 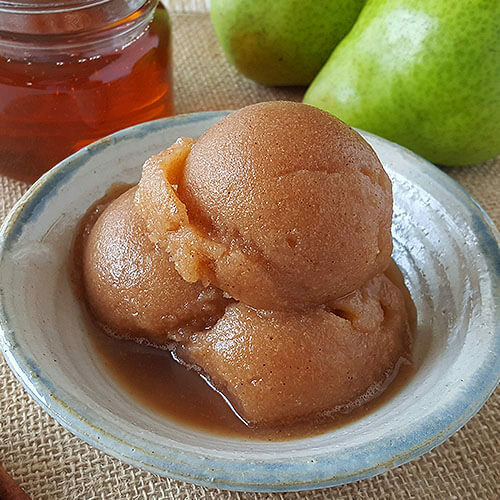 As these last hot days of summer fade into sweater weather, it's time to treat yourself to cool, refreshing, no-cook Spiced Honey Pear Sorbet! The key to this simple sorbet is to find the saddest-looking pears you can. When they're so ripe you can peel the skin off with just your fingers, they're perfect. 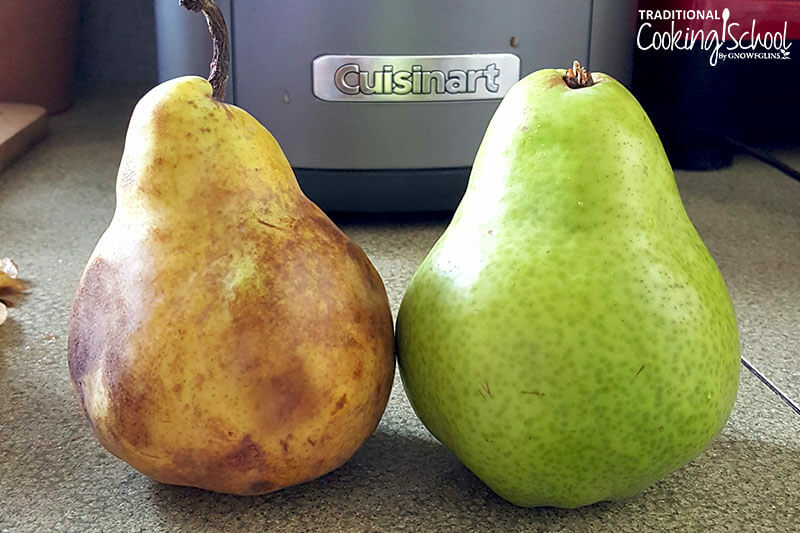 When I asked the produce manager for a discount because I wanted to “adopt” all their sad pears, I had to explain the difference between “sad” or “ugly” produce, and “bad” produce. They didn't want to sell me the sad pears at first because they thought they had gone bad. But no, they just needed a little love! This simple, whole-foods spiced honey pear sorbet perfectly captures the in-between season that characterizes September. Some days it’s like the middle of summer again. Other days you’re in a sweater and wanting something cinnamon-spicey. I can think of no better way to use the last of the season’s fresh pears, either! Is This Spiced Honey Pear Sorbet THM-Friendly? 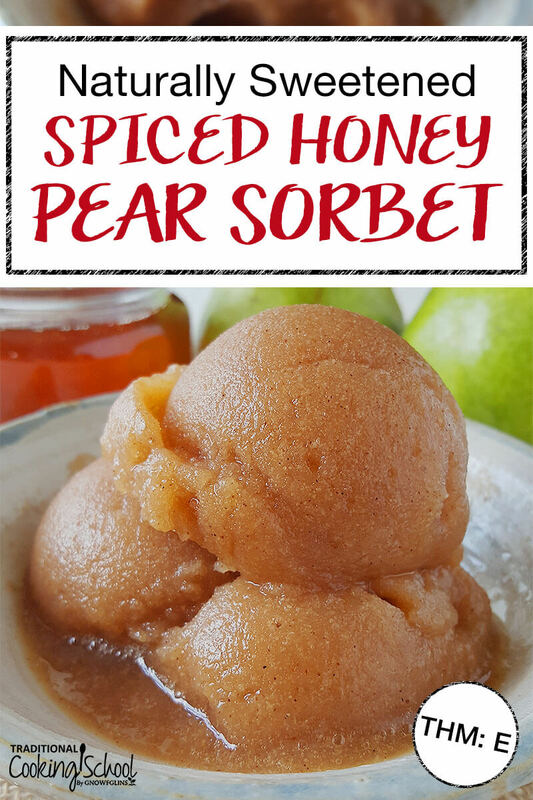 This spiced honey pear sorbet is naturally fat-free, so it is suitable as an THM:E treat… on occasion due to the honey. You can also try your favorite on-plan sugar alternative instead of honey. Just add a small amount at a time until you achieve the sweetness level you desire. 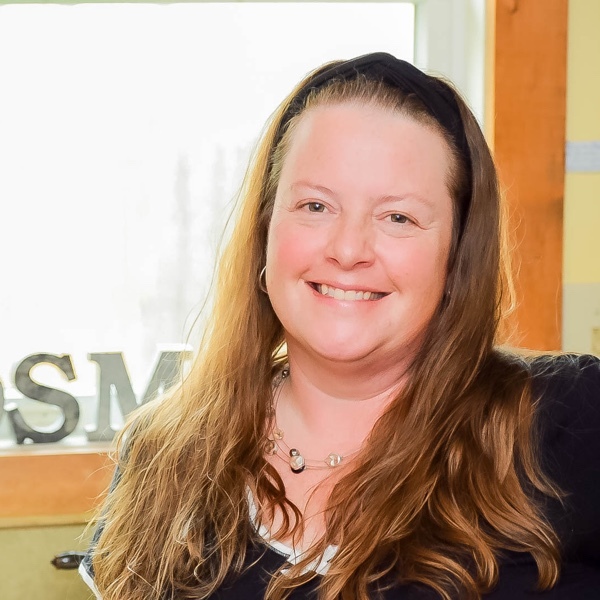 Local raw honey is such a healthy whole food sweetening option, though. Unless your blood sugar simply can't handle it, I highly recommend treating yourself! Bring on the sad, ugly pears! It's time to satisfy your cinnamon cravings and treat yourself to homemade, healthy no-cook Spiced Honey Pear Sorbet made in your ice cream maker in less than 30 minutes. This easy naturally-sweetened fruit dessert is fat-free and THM:E so any Trim Healthy Mamas can indulge, too! 5 pounds pears the saddest looking you can find! If necessary, let your sad pears sit on the counter for a few days until they're so ripe you can peel the skin off with just your fingers. Remove any bruised spots. Peel and core. Give the ripe flesh a good whirl in the food processor, until smooth. Strain the puree through a sieve (no need for a fine mesh one). This will filter out any remaining skin and chunks. Add spices and raw honey. If desired, use less honey but keep in mind the natural sweetness of the pairs diminishes once frozen. Add pear puree to ice cream maker according to its instructions. You may need to turn the machine on before you pour in the mixture. As soon as the pear sorbet is suitably froze and thick, enjoy immediately! It will melt quickly. Freeze any uneaten portion. If desired, add some neutral-flavored alcohol such as vodka to the pear sorbet during the last few minutes of freezing time in the ice cream maker. This will keep it from freezing too hard once moved to the freezer. A bourbon spiced pear sorbet sounds amazing, don't you think? Will you make this Spiced Honey Pear Sorbet and embrace the transition to Autumn? This would also make a great spiced pear sauce (like applesauce) if you don’t want to freeze it. Could also cook it down to make a Pear Butter! My other tip would be to remember that pears are on the Dirty Dozen list, so I would get organic, if at all possible!